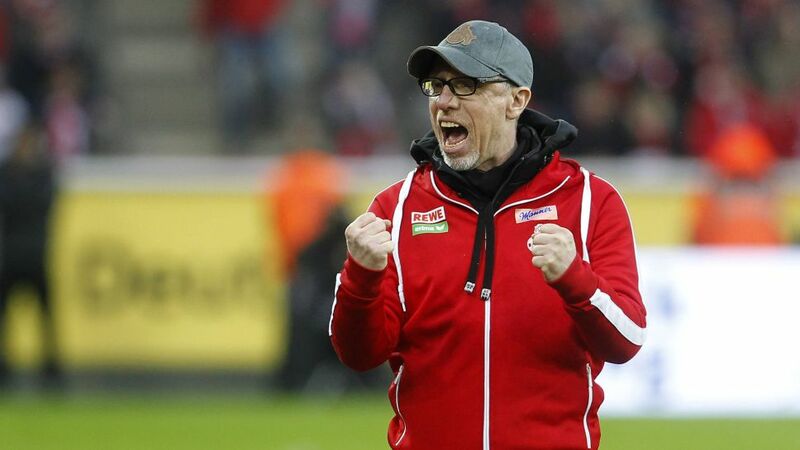 Though his side are unbeaten in five Bundesliga meetings with Borussia Dortmund, Cologne coach Peter Stöger insists that the Black-and-Yellows will be the favourites when the two sides cross swords at the SIGNAL IDUNA PARK on Saturday (kick-off 15:30CEST/13:30GMT). Ever since Stöger took over at the RheinEnergieSTADION in the summer of 2013, Cologne have become a thorn in Dortmund's side. BVB's last victory over the Billy Goats came back in March 2012, with a 6-1 demolition that hastened Norwegian coach Stale Solbakken's exit from the club, as they were ultimately relegated to Bundesliga 2. Having narrowly missed out on victory over high-flying Hoffenheim last time out, Cologne will have another opportunity to boost their European hopes this weekend – but Stöger knows that Dortmund's confidence will be sky-high following their DFB Cup semi-final victory over holders Bayern Munich in midweek. "It's true that they used a lot of energy on Wednesday night," he admitted. "But on the other hand, a win in Munich is a huge boost for morale. If you saw that game, you saw that we'll be up against an excellent side. Hoffenheim are an outstanding attacking team, but Dortmund are even better." By his own admission, Stöger is not a fan of statistics, and it is true that they don't tell the whole story when it comes to these two sides. In their five-game unbeaten run against Dortmund, Cologne have enjoyed average possession of just 28 percent – and on their last trip to SIGNAL IDUNA PARK, it was as low as 17 percent. Yet they still came away with a point. "My record may be two wins and three draws against BVB," the 51-year-old conceded. "But you also have to bear in mind the fact that Cologne haven't won there since 1991." Milos Jojic and Leonardo Bittencourt should have recovered in time to feature for the Billy Goats as they look to make it six games unbeaten against the Black-and-Yellows, and possibly even claim their first away victory in a generation. Konstantin Rausch is expected to miss out, while Stöger will be hoping star striker Anthony Modeste continues to put pressure on Dortmund's Pierre-Emerick Aubameyang in race for the top scorer's cannon. Click here to see who are the current top-scorers in the Bundesliga. "Modeste and Aubameyang are two great strikers, I think they could even play together. Maybe in Cologne," he joked. Cologne are currently three points off sixth place – the final UEFA Europa League qualifying spot – while Dortmund are a point ahead of Hoffenheim in the battle for third, which leads directly to the UEFA Champions League group stage. Above all, the Billy Goats have to be wary of another momentum swing in their head-to-head with BVB – before their current five-game unbeaten run, they had lost eight games in a row against their North Rhine-Westphalia rivals.